Station wagons are old-fashioned; just ask any automaker in Detroit. From a tiny market share in the pre-war years, station wagons jumped to almost 18% of American new car sales in the 1950s and 1960s. Almost every American car line, large or small, offered a wagon. In the late 1970s, fuel crises took their toll on the large American family cruiser. In the mid-1980s, the minivan replaced the wagon as the family hauler of choice. Today, only a few American-badged station wagons remain: Ford's Taurus and Focus, Mercury's Sable, and GM's Saturn. The last classic "Mom's Taxi," the Buick Roadmaster, disappeared in 1996. So where did they go? Nowhere! They are still around and more popular than ever. Many still do duty as "Mom's Taxi," but now they are called something else: SUVs. In April of this year, car buyers in the United States bought close to 300,000 sport utility vehicles. Only passenger car sales exceed the total rolled up by the popular SUV. Women make up a large percentage of SUV customers. Indeed the image today is the "soccer mom" with her busy schedule. If you look closely enough, you will notice the overall effect is the same as "Mom's Taxi": A woman in a two-box vehicle hauling kids or groceries. As most often happens in real life, the women in the ads never seem to take advantage of the offroad capabilities. In addition to their popularity among buyers, the manufacturers love SUVs. Along with other members of the light truck segment, they provide the overwhelming majority of the profits made by Detroit's Big Three. For that reason, there are now more than fifty different SUV models on the North American market and more are on the way. 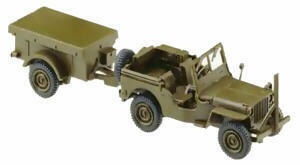 Roco model 444 is a nice model of the Willys MA, the first production version of the World War II jeep. The trailer is included. Today's SUVs range from small and light, like the Kia Sportage, to large, like the Ford Excursion, which weighs in at almost three tons. The most popular configuration, in terms of sales, is essentially a station wagon body on a light truck frame. There is a bit of irony here. When station wagons were first introduced, they were regarded as commercial vehicles. Ford actually classified them as trucks. The first station wagons were called "depot hacks" because they were designed to be used as taxicabs for railroad passengers with lots of luggage. In the years before World War II, station wagons commanded such a small share of vehicle sales; the car manufacturers actually had the bodies produced by outside companies. It wasn't until after World War II the big car companies started pushing them for family transportation. A number of pundits trace the origins of the SUV to the Willys-Overland MA and MB and Ford GPW, better known as the "truck, ¼ ton, general purpose" or "jeep." The World War II jeep has been called the most significant 4-wheel drive vehicle of the Twentieth Century. It was the first 4-wheel drive vehicle to be mass-produced. Over 700,000 were built during the war years. But it was more the grandsire than the parent of the modern sport-utility vehicle. A year after the War's end, the real ancestor of today's most popular sport-utility vehicles appeared. In 1946, the Jeep station wagon made its debut. It was the first station wagon with a factory-built all-steel body. At first, the Jeep station wagon was a conventional rear-wheel-drive vehicle, but 4-wheel drive and a six-cylinder engine became available by 1949, making it unique among American station wagons until the appearance of the AMC Eagle in the 1980s. The boxy Jeep wagon was reasonably popular, but was always a niche vehicle, appealing to a customer with particular tastes or requirements. The Jeep Station wagon remained in production until 1964 with few significant exterior changes. During that time, Willys-Overland went out of business, having first sold the Jeep to Kaiser Manufacturing Company, a huge conglomerate with a broad range of interests. In 1964, a newly restyled Jeep station wagon was introduced. The new model was slightly less boxy than the original and was renamed the Wagoneer. The Wagoneer offered a more powerful six-cylinder engine and was quite popular, especially in regions with lots of snow or little paving. True to Jeep's tradition of long model runs, the Wagoneer was produced until 1991. The Wagoneer was the model that caught the eyes of the Reagan-era yuppies who kindled the modern SUV craze in the 1980s. Smaller and lower than the big K-5 Blazer and Ford Broncos, but more luxurious (and expensive) than the smaller S-10 Blazer, the Wagoneer was everything a young upwardly mobile professional could want in a 4-wheel-drive vehicle. Comfortable, easy to drive with its Quadra-Trac system and automatic transmission and loaded with options, it was the utilitarian alternative to the BMW lifestyle. Herpa no. 021784 is a green Jeep Cherokee in standard finish. Herpa also offers a metallic blue finish as model no. 031783. 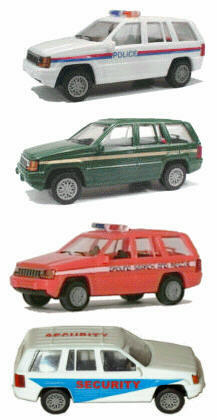 The Herpa models are based on the European version of the Grand Cherokee. The best-selling Jeep model since its introduction has been the Jeep Grand Cherokee. Officially known as the ZJ series, the Grand Cherokee was introduced in 1992 to provide an upscale model to replace the discontinued Wagoneer. Until recently, the Grand Cherokee was second only to the Ford Explorer in the sport-utility market was in the top 20 vehicles in North American sales every year from 1994 to 2001. The Grand Cherokee is sold around the world. It is produced both in North America and in Graz, Austria under a long-standing arrangement with Steyr-Daimler-Puch Fahrzeugtechnik (now MagnaSteyr). Herpa used the first-generation European version, introduced in 1994, as the prototype for their model. Promotex offers several versions of the Jeep Grand Cherokee. From the top: 006244 Police; 006243 Forest Service; 006221 Ground Search & Rescue; 006268. Also available are standard models in a variety of colors. Sadly, other than the Herpa Cherokee and Roco Willys MB, there aren't any high-quality ready-to-run Jeep models available. Roco is bringing their M38A1 model back, but it is different from the civilian CJ-5. Spanish modelmaker Eko offers a 1:87 scale model of the early Jeep Station Wagon. Walther's is the main source for Eko models; the Jeep part number is 265-2078. Eko models are fairly crude and require a lot of work to make them a presentable model. It would be nice to see a quality model of the Wagoneer. How about the future? At the moment, the forecasting the fate the familiar SUV is a bit iffy. The market is increasingly crowded and competition is fierce. This is driving down profit margins. Beyond market pressures, the Detroit automakers are facing a number of new challenges from lawmakers. However, Jeep survived for years as a comparatively low volume brand and it has one of the strongest names in the automotive world. There is little doubt there will be more Jeeps in the years to come. As for the station wagon, it seems to be making a comeback. The majority of the new "crossover" vehicles are really just station wagons under another name. They are based on passenger car platforms even though some have jacked-up suspensions and most have all-wheel drive at least as an option. As buyers' tastes change, "Mom's Taxi" may once again be a familiar sight on the American road. Bill Cawthon is an award-winning modeller and collector. His primary modeling interests are model railroading and vehicle models in 1:87 and 1:160 scales. He has written numerous articles for regional and division NMRA publications and is a contributor to the newsletter of the 1-87 Vehicle Club. He follows both the automobile industry and the European scale vehicle industry. In real life, Bill is a full-time marketing and public relations consultant for the high-tech industry. He lives in Houston, Texas with his wife and four children. Bill writes bi-weekly for Promotex Online. To learn more about him, click here.